Oi Vey Playoff Controversy strikes again! In the playoffs there is inevitably going to be controversy one way or another BUT hopefully not so much that it will impact the final outcome of a series. There will ALWAYS be a bad call or two made within a series, but you have to hope that those calls don’t come back to haunt a team. Last night there was yet another playoff controversial call made that made SOME people very irate and SOME people very happy…depending which side you are on. The call made on the ice brought to mind an incident that occurred last year in the second round of the playoffs. Let’s go back to one of last year’s worst calls that nearly determined a series…game 7 between the Chicago Blackhawks and the Detroit Red Wings. The Blackhawks scored what they thought was the go-ahead goal with less than two minutes remaining in regulation only to have the refs call the goal off and nearly cost Chicago the series. The goal was called off…in game 7 with less than two minutes remaining in regulation. The team was forced to regroup and return for overtime. It was absurd in the sense that overtime should not have been required but it was and all that mattered to both teams was the next goal wins and moves forward. Had the Blackhawks NOT found a way to get the overtime goal in game 7, that terrible call made in the final two minutes of regulation would have not only determined the series outcome but haunted the Blackhawks all off-season. We all know what happened in the end, the Blackhawks scored a goal in overtime that could not be taken away ending the Red Wings post season and eventually went on to win the Stanley Cup. Some people will argue that it was a good goal and others will argue that it was definitely not a goal. At the end of the day, it does not matter because regardless of what the call should have been, the Kings were determined to not go without a fight and in doing so tied the series 3-3. The Kings have battled back from a 3-0 series and will look to complete the comeback in game 7 with a victory. 1. In the 1942 Stanley Cup Final, the Maple Leafs came back from a 3-0 deficit against the Detroit Red Wings to win the Stanley Cup. 2. In 1975 the New York Islanders came back from a 3-0 deficit against the Pittsburgh Penguins in the quarterfinals to advance to the semifinals. The Islanders lost in 7 games in the semifinal to the eventual Stanley Cup champion, Philadelphia Flyers. 3. In 2010, the Philadelphia Flyers stunned the hockey world when they not only came back from a 3-0 deficit in the series but also a 3-0 deficit in game 7 against the Boston Bruins to win the series 4-3. The Flyers went on to the Stanley Cup Final, losing in 6 games to the Chicago Blackhawks. There have been many teams that have been CLOSE to accomplishing the comeback completed feat but only 3 teams have stolen their series…the question is, will the LA Kings become the 4th team in NHL history to accomplish the feat? Or will the Sharks steal their thunder with some game 7 heroics? We will have our answer at the final buzzer of game 7 between San Jose and LA as their game will wrap up the end of round one. Are you ready hockey fans to see what will unfold in these last two days remaining in the quarterfinals of the 2014 NHL playoffs? We are in for a wild ride to the finish and we’ve still got three more rounds to go before all is said and done! As always, until next time, nuck said. Sometimes it is a smooth ride along the track that is an 82 game season and sometimes its a very bumpy one. The Canucks 2013-2014 season definitely falls in the bumpy route category. It came down to a long shot in which everything had to align just right in order for the Canucks to sneak their way into the playoffs but of course things never go as planned and the Canucks will not be participating in the 2014 NHL playoffs. Does this mean I will stop supporting the team or that I will not watch any playoff games? No. There are STILL 3 games left for the team to play & I don’t know about you, but I WILL support the team nice & LOUD. I will be there all the way to the final buzzer of game 82, all off-season, & come October when it all begins anew. In regards to that official playoff hockey, while I wish my Canucks were in that group, I will of course still be watching. The Canucks are my team BUT I am also a hockey fan at the end of the day, and there is something special about playoff hockey no matter who is playing. 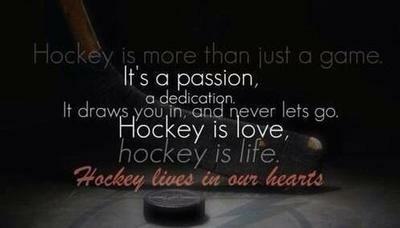 Hockey is like a roller coaster, there will be ups & downs BUT nothing can take away the thrill. It has been a very trying season between an insurmountable number of injuries and just plain bad luck. I guarantee that this was not how the team envisioned their season going as the mission always is to be in the final 16. Bad seasons will & do happen to EVERY team in the NHL…but that is not when we stop supporting a team. It is seasons like THIS when we should support them more! Changes will happen as they always do after a season like this one and the changes have already begun. Rumor became fact with the announcement that Mike Gillis had been relieved of both his GM and President duties and that was the right decision. I am to the first to admit that while I didn’t I always agree with Gillis, he DID do some great thing with this team -helping them get to the playoffs 5/6 years including the 2011 SCF, brought in Sundin, Samuelsson, Malhotra, Higgins, etc., so rather than focus on the negativity that the local medal will tell me to, I’m choosing to focus on the positives that he brought to this team. The Canucks are holding a press conference at 10:30 AM (PT) at April 9th, 2014 to address Gillis being let go and potentially announcing his replacement. Questions are mounting as to whether there will be a separate General Manager and President (or one combined) and WHO could potentially be stepping into those shoes. Rumors are swirling from Bob Nicholson to Trevor Linden and even potentially Markus Naslund. Tomorrow more answers on this front will be revealed. As for Torts, I say give him another year. Letting Torts go would be a mistake. Let’s give Torts a real chance to prove himself with a healthy roster & see what happens.Torts has proven himself with every previous coaching post he’s held that he improves over time and you can hardly blame the guy for everything that went wrong this season. Let’s see what Torts can do without everyone second guessing him every other day and a ridiculous amount of injuries piling up all at once. I do NOT fall in the camp that believes a FULL rebuild is necessary…some changes YES BUT more importantly we NEED a healthy roster for the FULL 82 games & remember our prospects: Horvat, Shinkaruk, Jensen, Fox, Gaunce & co. will be looking to crack the roster. Chin up Canucks fans, the future looks much brighter for our team than most realize! Let’s enjoy these final three games and look forward to the changes that will come. As for the rest of you hockey fans, are YOU ready for some incredible playoff hockey? The madness is set to begin April 16, 2014. Where will you be watching the madness from? Being a hockey fan is like riding a roller coaster from initial anticipation to the ups and downs to the irreplaceable thrill of the ride. Every season is a different story and every season a new champion emerges and come mid-June the book on the 2013-2014 NHL season will come to a close. Are you ready to discover the ending? Out of Odds & Down to a Long Shot? From game 1 to game 82 every season, I will always be a Canuck to the core. It’s incredibly easy to cheer for and support a team when everything is going well but can be incredibly difficult for some to do the same when things are not going well with a team. Like my Vancouver Canucks for example, has this season been picture perfect for them? Not even close. So many things that seemed like absolute impossibilities did in fact occur this year. Rumors of rebuilding and throwing Torts under the bus have become a part of the everyday vernacular with the local media. I cannot recall there EVER being a season in which nearly every big name player has been injured at some point of the season and often more than one of them at the same time. It has been an extremely rare occurrence to have a complete roster in the second half of the season. The impossible has hit the team in the most ridiculous ways: injuries galore, a suspension to Torts, a trade that couldn’t be done felt like it was done over night, iron man Henrik Sedin who has almost never missed a game was forced to sit out not once but twice this season due to injury. To be completely honest, I do not think it fair to judge John Tortorella on a season in which he never had a complete roster at any point of the season for a long stretch to the absurd injury massacre that hit the team this season. Torts not returning to the Canucks come September would BE a mistake in my books. Why not see what actually happens when he has a FULL roster and the odds are not stacked against him? Torts has proven in his past coaching experiences that he improves over time getting BETTER once he’s past the first year. I’d like to see what will happen in year two and potentially a healthy roster before we send him packing. I think it would better to have Gillis step down from his GM duties and bring in a new voice as General Mangager…perhaps someone like Markus Naslund(*familiar with the organization, players, fans & media as well brings his experience with MODO in the Swedish Elite League). Am I an optimist? Probably but I am also realistic and I am well aware that the odds are stacked against the Canucks making it to the playoffs this season BUT whether they make the playoffs or not does not make or break my support for the team. I am now and have always been and always will be a fan and supporter of the Vancouver Canucks. Bad seasons will and do occur for every team in the NHL. Is it easy to watch when the bad seasons happen? No, but bad seasons are not why you chose to support a team and bad seasons are not a reason to stop supporting a team. If anything, that is when you should support them even more. It is down to long shot and getting a lot of help from other teams while winning. The odds may not be in their favour according the near impossible to overcome stats or the every day doomsday media opinion, but that doesn’t mean I will cheer any less or quieter when the Canucks hit the ice. Five games remain on their regular season schedule to be played out and no matter what the end result I will still be a Canucks fan to the end.